Indomitable | The online home of Chauncey DeVega: Martin Luther King, Jr. In America’s poorest ghettos, the Rev. 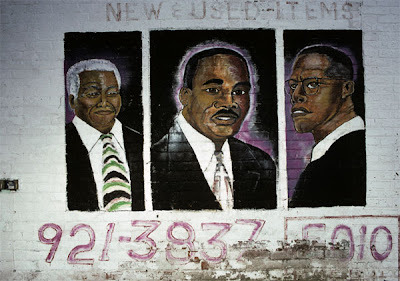 Dr. Martin Luther King Jr.’s portrait is one of the most popular subjects of public art. 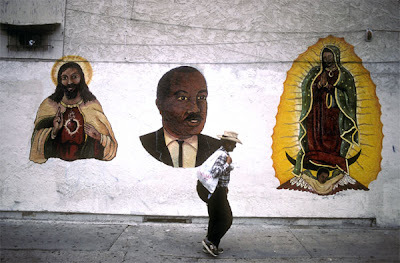 These images, which I have been documenting since 1977, regularly appear on the walls of the liquor stores, auto-repair shops, fast-food restaurants, mom-and-pop stores and public housing projects of Chicago, Detroit, Los Angeles, New York and many other cities across the country. The majority are the work of amateur artists. Though Dr. King is usually front and center, he is often accompanied by other inspirational figures: Nelson Mandela, John Paul II, Malcolm X, Rosa Parks, Mother Teresa, Pancho Villa. 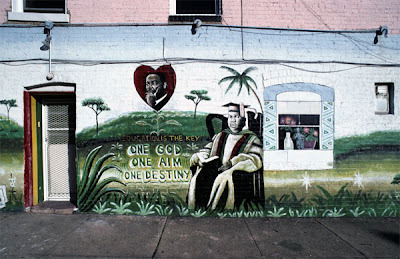 He is often accompanied by his famous phrase, “I have a dream” – a reminder that in many of the communities where these murals exist, the gulf between hope and reality remains far too wide. its good to see some people still give a damn of living up to MLK's dream of peace and unity. If only most effing Americans gave a damn.